What is a come along? How to use a come along? A come along is also known as hand winch is a commonly used tool for installing shade sails. It has got a body and lever arm. On the body, there are two types of ends available. One is fixed and the other one is flexible. The running end supplies all the movement. You have to move the running end to wrap the wire end around the spool in the centre of the body. You can do spooling by pivoting the lever arm and utilizing the latches. The come along has two latches that you can find on the body. These prevent the spool from unwinding as the force is applied to the running end with lever arm. Then there is a second latch that you will find on the lever arm and it advances the spool to coil the wire rope on it. At last, the wire rope that is present on the running end will terminate with a hook. Most of the people these days use a modified version of come-along that comes with a pulley. While there are many models available in a come along that you can buy online, it is best to purchase the one that is easy to use and effectively suit your needs. Coming to next section, there are various benefits of a come along winch. This tool is used in industries and you can also buy a smaller version for domestic usage. We highly recommend keeping one at home because you don’t know when this little tool can come handy and solve the purpose. It is usually used by hand and you can take benefit from it for winding the cable or a rope. There is a brake on the tool that prevent the rope from automatic unwinding. That is why we say that it is quite beneficial for home users plus it is really easy to operate. It is easily portable and you can take it to your farmhouse while taking your family for a day off. Other than the basic ones, this tool is proven to be quite helpful in many routine situations. As said earlier, there are different types of come along available in the market with different capacity of weight lifting and different sizes as well. People working in construction fields use this tool mostly. It can be used to lift, lower or stretch the objects. From its variable tendencies, it is quite useful for the home users as well. In industries or construction sites, a come along cable winch can be used to pull new construction frames together as they are raised for a purpose. It can also be used as a towing device. So, as you can see, this tool can serve various purposes to the users. It can also be used on ships and boats or moor lines and pull anchors. Considering the fact that there are plenty of reasons for industries and domestic user to have a come along, you need to assimilate which kind and size will be suitable for your needs. This tool can be used to remove tree roots with ease. You need to follow instructions on how to take care of such a task. Clean up the area around the tree, so you can roughly 3 or 4 feet to work with attaching this root removal tool. 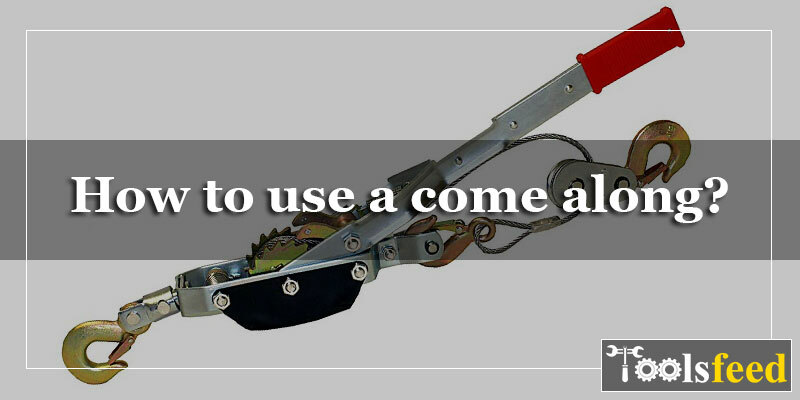 You will attach the tool to a heavy stationary object or to a trailer hitch on a large pickup or diesel truck. Unwind the cable and hook from the tool. You will need to spot the upper portion of the tree and then wrap the tool’s cable around it. Afterwards, you will need to attach the hook to the cable, which will form a tight loop around the trunk of the tree. Operate the tool’s handle in order to put the trunk to one of its sides, which will expose its roots. Use a spud bar to cut the roots out from underneath the trunk. Continue this process until all the roots are removed from underneath the tree trunk. You see; the come-along winch can be put to very good use. As you can tell, this tool definitely has many uses. If you want to obtain a come-along winch for your workshop or truck, it is not difficult to find that that perfectly suits your needs and they are often priced according to the capable load ratings. Nonetheless, if you want to use something so handy, this tool can surely be one that will allow you to take care of various situational tasks. This winching apparatus can likewise be utilized for introducing shafts, for example, flagpoles, utility poles or extensive fencing posts. For instance, on the off chance that you don't have a bulldozer or a crane to lift a wooden utility pole and have it set in the gap, you will then need to get your hands on a tag along winch. At any rate, this instrument is no place close as costly as a crawler or a crane. You should put one sets of wooden 2x4s down the gap keeping in mind the end goal to prop the base of the utility pole. Subsequently, burrow a trench that will be set toward the path where the post will be found. When the post is lying in the trench, support it with the match of 2x4s while pulling it in the upright position. You ought to connect the go along winch on the utility pole as high as you can on the question. Get 2 or 3 aides to ensure that the utility pole does not influence forward and backward as you mechanically winch it to the best. In the nations like United States, military officers and soldiers that use heavy vehicles mostly take help from this kind of equipment such as come along. These are used to strap the ammunition, mission bags, and other military supplies on the top of the surface. The strap winch is used in military training and actual battleground as well. There are so many places where a come along can be of great help. If you are planning to buy one then go ahead because this tool is worth spending each penny. What Is A GFCI Outlet & How To Replace A GFCI Outlet?